These lecture notes are a guided tour through the fascinating world of polymer chains interacting with themselves and/or with their environment. The focus is on the mathematical description of a number of physical and chemical phenomena, with particular emphasis on phase transitions and space-time scaling. Text for a second course in stochastic processes. It is assumed that you have had a first course on stochastic processes, using elementary probability theory. You will study stochastic processes within the framework of measure-theoretic probability. From the table of contents: Stochastic Processes (Probability Spaces and Random Variables, Definitions and Examples); Jump Processes (The Poisson Process, Superposition of Poisson Processes); Markov Chains; Martingales; Stochastic Calculus. 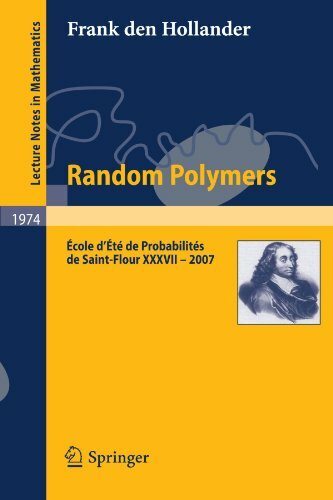 These lecture notes are intended to be used for master courses, where the students have a limited prior knowledge of special topics in probability. We have included many of the preliminaries, such as convergence of random variables, etc. This text surveys random variables, conditional probability and expectation, characteristic functions, infinite sequences of random variables, Markov chains, and an introduction to statistics. Geared toward advanced undergraduates and graduates.